EDITORIAL: Does God Want America To Bail Out the Big Three? Of all the states that are struggling as a result of the U.S. economic crisis, we know that Michigan is being hit the hardest. Our state economy is so dependent upon the automotive industry that the collapse of any of the “Big Three” automakers could mean the difference between prosperity and poverty for thousands of families. This would put a heavy burden on government to increase state-funded assistance, which would increase taxes and further penalize non-automotive workers and professionals who are already enduring hard economic times. So, it’s safe to say that many Michiganders of faith have been praying for a miracle. One church took that to the next level. You may have seen Bishop Charles H. Ellis III, pastor of Greater Grace Temple of the Apostolic Faith in Detroit, Michigan on FOX News earlier this month. Bishop Ellis gained national attention by holding a prayer service for the Big Three with three hybrid SUV's on the altar (yes, the sanctuary at Greater Grace Temple is that big). 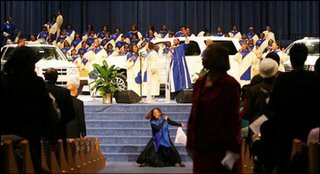 The three sport utility vehicles were actually parked on the altar as ministers prayed for Congress to bail out Ford, Chrysler, and General Motors. Bishop Ellis appeared on FOX News to share with the nation his rationale and perspective as a clergyman concerning the will of God in Michigan’s economic turmoil. If this is the first time you have heard this story, I’m sure you are a bit shocked and possibly even conflicted about the question of appropriateness or rightness of such an event. Before I saw this story, I already had conflicting feelings about whether or not the Big Three should be bailed out by American tax dollars. While it would help keep friends and family from going under, it goes against everything I believe politically. After the story first aired on local news here, my stomach really started turning. 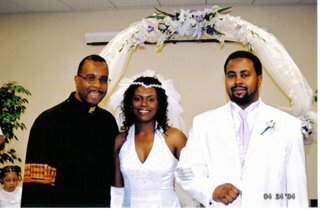 You see, until I got married and moved 150 miles west of Detroit in 2004, Bishop Ellis was my pastor. Does God want America to bail out the Big Three? While you may not be a Christian, I think that we can find our answer in the video clip of Bishop Ellis’ interview. He basically conveyed that it is his job to represent the interests of the people before God. I know that it is also his job to convey the interests of God before the people. Godly logic says that while the Lord’s perfect will would involve everyone taking full responsibility for their own actions and suffering the consequences nobly, the mercy of God dictates that the level of suffering must be bearable in order to be effective. Michigan is being chastised, but it does not appear that God wants us to be destroyed. Grace would not be grace if it were deserved. While Republicans like myself can argue that the automakers deserve to go bankrupt, maybe God is giving Michigan ‘greater grace’ than what politics would call for. Maybe God heard his people saying, “Lord, have mercy”, and he decided to grant their request. Apparently, my God really does answer prayer. As long as it's a loan I guess it's OK.
My concern is that the CEO's who currently control the Big 3 are all about how much money they can stuff into their personal bank accounts. I don't think any of them are of the same caliber as Lee Iacocca, who borrowed from the government back in 1979 to save Chrysler. Lee paid that loan back early, with interest, so Joe Taxpayer actually made money on that deal, and Chrysler was saved. Will Americans buy Chevy Volts like they bought Chrysler K-cars back in the early 80's? Let's hope so.